and is going to Galilee before you"
We have come to the climactic conclusion of our roller coaster liturgical week. First, Jesus' triumphant entry into Jerusalem on Palm Sunday, then the loving example of Jesus washing the feet of his disciples at the Mass of the Lord's Supper on Thursday ("As I have done, so you also must do." Then on Good Friday, the abject sorrow of Jesus' passion, death on the cross and burial. And now, that passion, that sorrow has been turned to incalculable joy as we learn that He is Risen! And with Jesus, so too will we rise to be with Jesus forever. The Vigil Mass features numerous Old Testament readings that highlight many of the key moments in salvation history beginning with the creation story (Genesis 1:1-2:2), "In the beginning, when God created the heavens and the earth, the earth was a formless wasteland, and darkness covered the abyss . . . ."
Following is the story of God testing Abraham with the sacrifice of his only son (Genesis 22:1-18) which is a foreshadowing of the sacrifice of God's only begotten Son, "Take your son Isaac, your only one, whom you love, and go to the land of Moriah. There you shall offer him up as a holocaust. . . ." Then comes the story of God parting the Red Sea so the Israelites could escape the Egyptians (Exodus 14:15 - 15:1), "The Lord said to Moses, 'Why are you crying out to me? Tell the Israelites to go forward. And you, lift up your staff and, with hand outstretched over the sea, split the sea in two. . . .'" The next reading is the prophesy of the Prophet Isaiah near the end of the Israelite's exile in Babylon (Isaiah 55:1-11). Isaiah looks forward to the day of liberation, "All you who are thirsty, come to the water! You who have no money, come, receive grain and eat; come, without paying and without cost, drink wine and milk!" In our Gospel reading (Matthew 28:1-10), we hear Matthew's account of the resurrection, ". . . an angel descended from heaven and rolled back the stone and sat upon it. . . . Do not be afraid! I know that your are seeking Jesus the crucified. He is not here, for he has been raised just as he said." The Easter morning readings are shorter and focus more succinctly on Jesus' resurrection. The first reading is from the Acts of the Apostles (Acts 10:34, 37-43) and is an excerpt of one of Peter's speeches boldly proclaiming the risen Christ, "You know what has happened all over Judea, beginning in Galilee after the baptism that John preached, how God anointed Jesus of Nazareth with the Holy Spirit and power. . . They put him to death by hanging him on a tree. This man God raised on the third day and granted that he be visible, . . . He commissioned us to preach to the people and testify that he is the one appointed by God as judge of the living and the dead. To him all the prophets bear witness, that everyone who believes in him will receive forgiveness of sins through his name." The Gospel reading (John 20:1-9) is John's telling of the events on Easter morning. On this glorious Easter Day, may we reflect on the words of Pope Saint John Paul II Angelus - 1986: "We do not pretend that life is all beauty. We are aware of darkness and sin, of poverty and pain. But we know Jesus has conquered sin and passed through his own pain to the glory of the Resurrection. And we live in the light of his Paschal Mystery - the mystery of his Death and Resurrection. 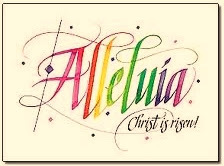 'We are an Easter People and Alleluia is our song!'"